Western Pacific from Japan to eastern Australia. Mediterranean. 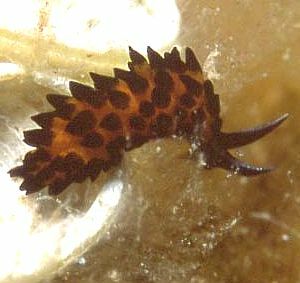 Originally described from the Naples, the Mediterranean species has been identified with this animal from the western Pacific. It is a strange distribution and the identity needs further investigation. 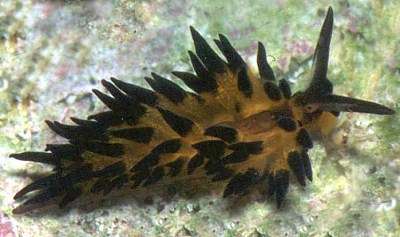 The enrolled rhinophores and blade-shaped radular teeth place it in the genus Placida. • Baba, K. (1959) The family Stiligeridae from Japan (Opisthobranchia- Sacoglossa). Publications of the Seto Marine Biological Laboratory, 7: 327-334. • Trinchese, S. (1893) Nuovi Ascoglossi del golfo di Napoli. Rendiconti dell'Accademia delle Scienze Fisiche e Matematiche della Societa di Napoli, 2(7): 154. • Trinchese, S. (1896) Ricerche Anotomiche sulla Hermaea cremoniana (Tr.). Memorie della Classe di scienze fisiche, matematiche e naturali, Serie 5, 6: 35-45. Is this a species of Stiliger?